The makers of the Freitag bags distinguish themselves not only by the choice of their material but also with the shop design. 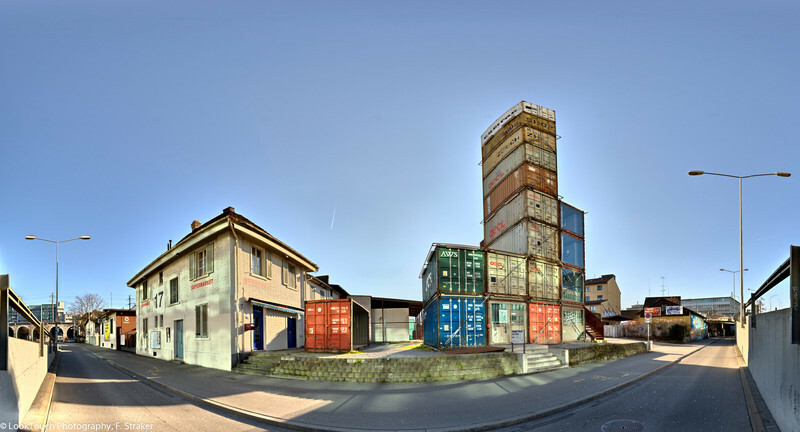 A stack of shipping containers is made into a very "raw" shopping experience. View from Duttweilerbrücke towards Prime Tower, the tallest building in Switzerland. The towers of the three most prominent churches in the Old Town of Zurich the Grossmünster, Fraunmüster and St. Peter are united in this view. The leftmost "Haus zum Rüden" has almost been completely destroyed by fire. It has been restored with a major effort. This image has been taken before the fire. Last hours of display for the illumination which earned much criticism and liitle endorsement. In 2009 a new illumination will be displayed.